A local painter’s remodeled abode is a personalized retreat designed for relaxing, creating and showcasing an array of artworks. Throughout his career, Fred Tieken has reshaped himself into all manner of creative personas: jazz musician, award-winning graphic designer, marketing firm proprietor, booking agent for rock bands, recording studio owner, painter—and along with his wife and business partner, Gail, consummate home remodeler. 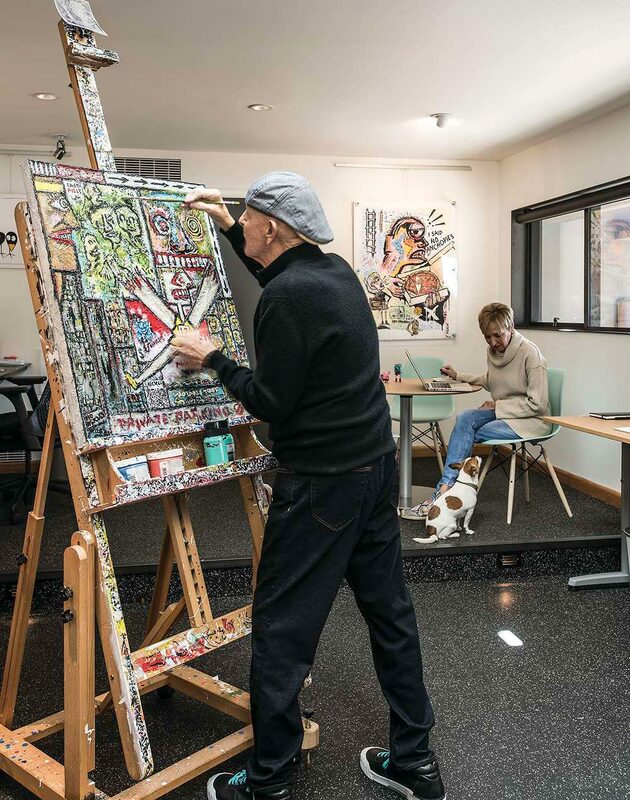 Painter Fred Tieken and his wife, Gail, are passionate about art. It fills every surface in their contemporary home. On the back wall is a painting by Jason Mejer. The pot in the foreground is of African origin. 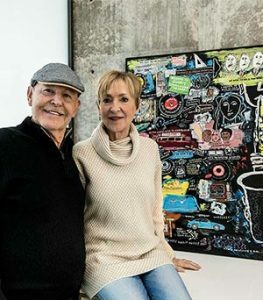 When the couple first moved to Arizona in 1986, they purchased a condo in downtown Phoenix, which they renovated and lived in for seven years. A second condo, a second renovation and another seven years followed. 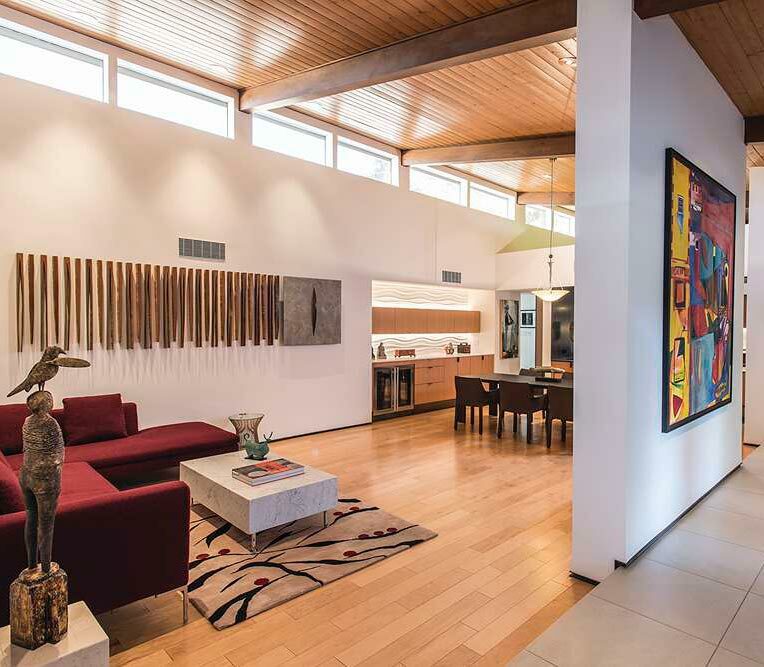 Then one day, while checking out houses, they passed by a contemporary home designed by architect Bill Richardson and built by Weldon Minchew. 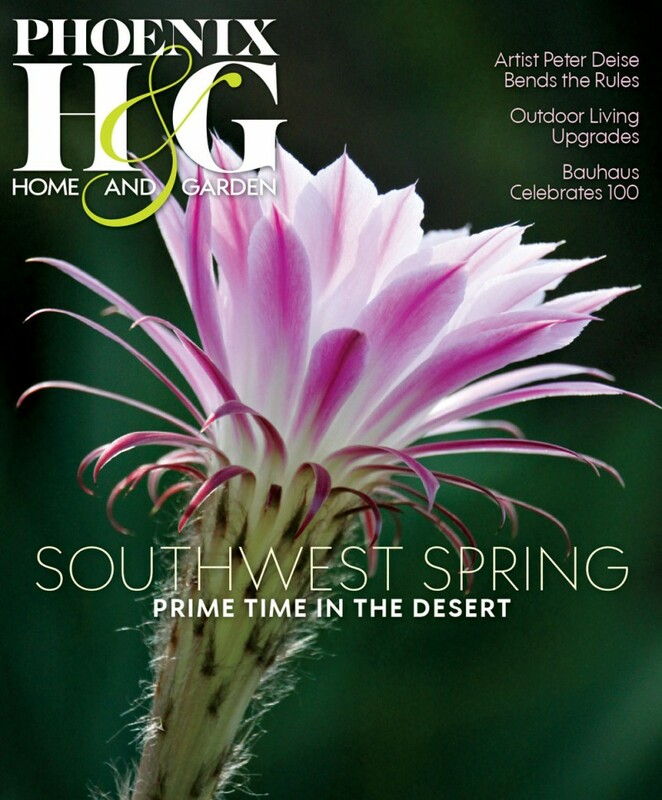 “We drove up to the house, and the exterior was light pink. Inside, the walls were light pink. The tile was pink. One room had indoor/outdoor green carpet. And the roof leaked like a sieve,” recalls Fred with a laugh. 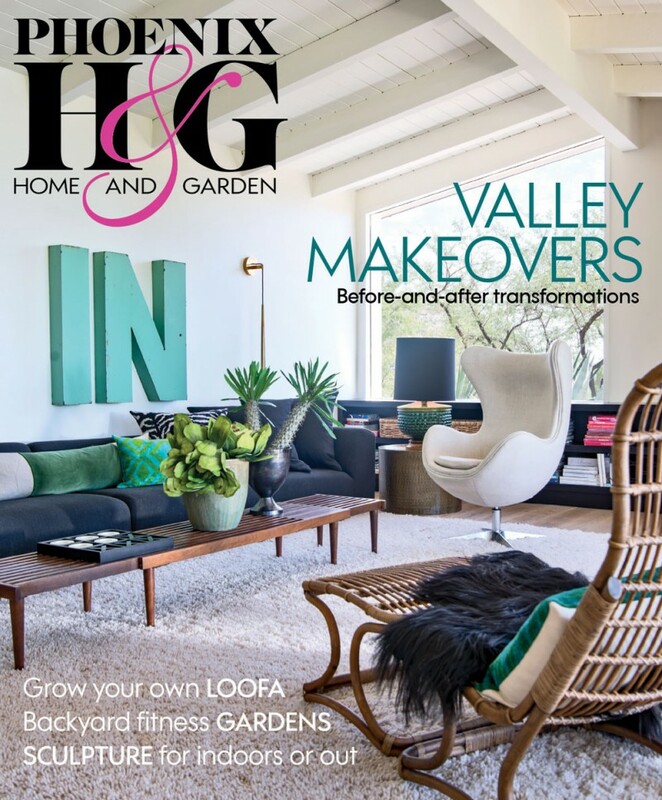 The couple quickly got to work fixing up the house—eliminating the pink, replacing the roof and tile, turning a large spare room into a home theater—and enjoying the relaxed lifestyle and year-round outdoor living provided by their Paradise Valley abode. It would be really hard to live without art. 1. 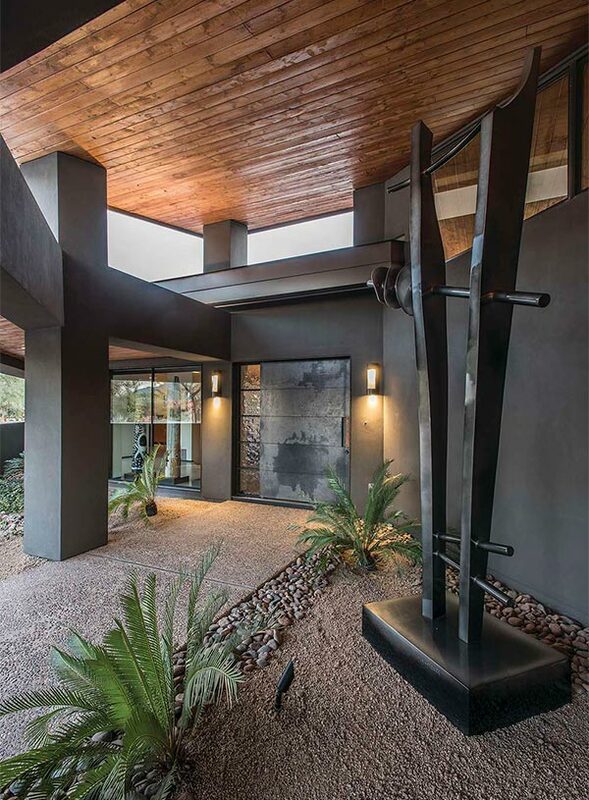 Architect Andy Byrnes created the custom steel pivot entry door, which elicits a sense of excitement upon approach. 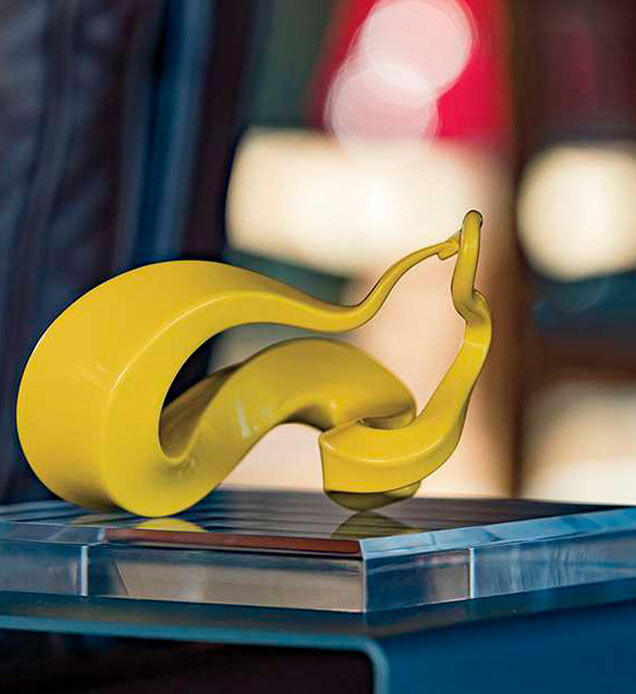 It is complemented by a towering sculpture by William S. Cordiner. 2. 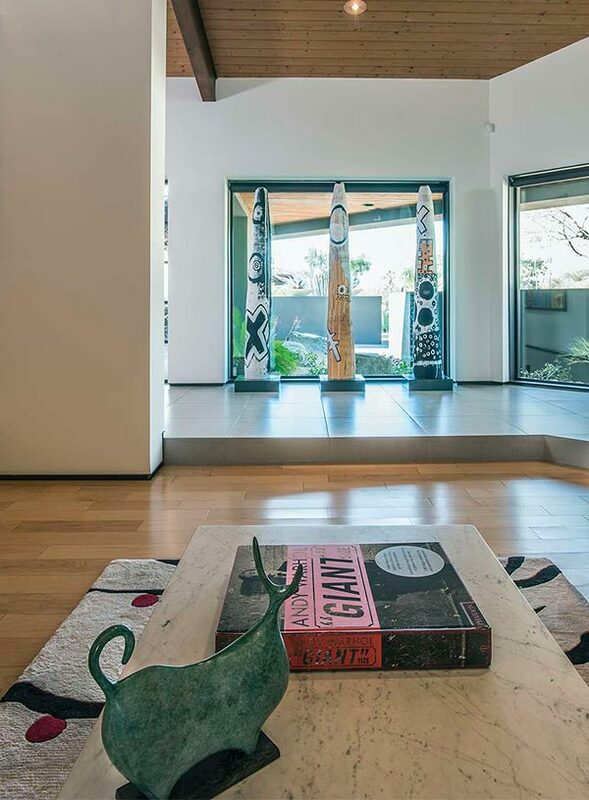 A trio of clay totems by Nora Naranjo-Morse draws attention to the large front window without blocking the view. While waiting for surgery, Fred decided that he was going to paint. His first piece, entitled “Pass the Mayo,” was a lighthearted take on the upcoming procedure. “Having that painting really helped us both. It was nice to look at it and laugh at what we had ahead of us,” Gail recalls. After surgery, Fred continued to pick up his brushes, and soon he was regularly painting works of art and showing in local galleries. 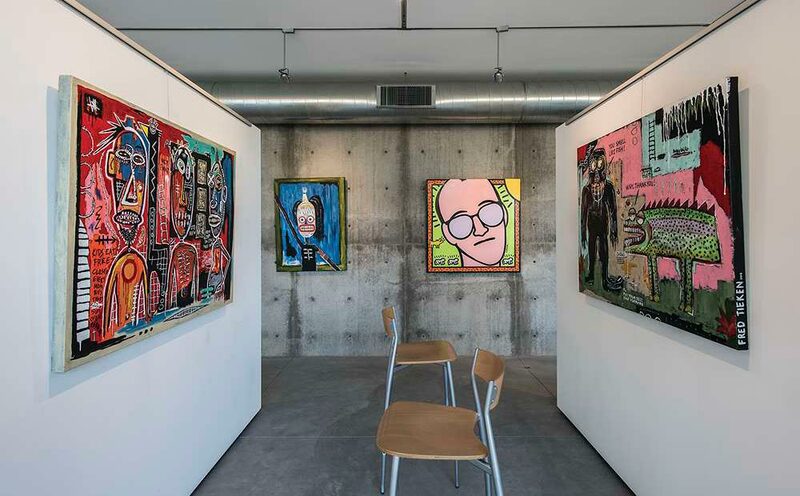 Created primarily in acrylics, and often recalling the graffiti-based, neo-expressionist obsessive scribblings of Jean-Michel Basquiat, Fred’s work is loose, frenetic, playful and bursting with color, humor and word play. The couple started looking at new houses, “but then we realized that we’d have to do just as much work to make them ours. Plus, we like our location,” says Gail. That’s when they decided to call in architect Andy Byrnes to give their residence a much-needed face-lift. Despite its original pink facade, the couple were taken with the home’s contemporary lines and strong bones. 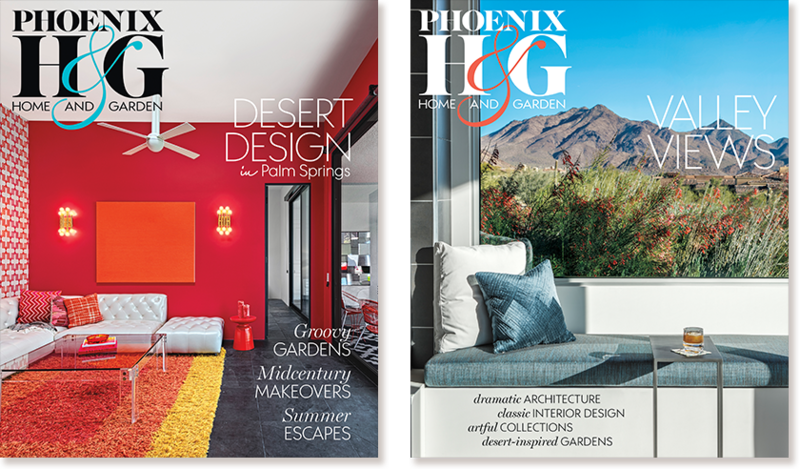 Byrnes reworked the exterior for a fresh, modern look, while landscape architect Stephen Bardorf added a desert-friendly garden. 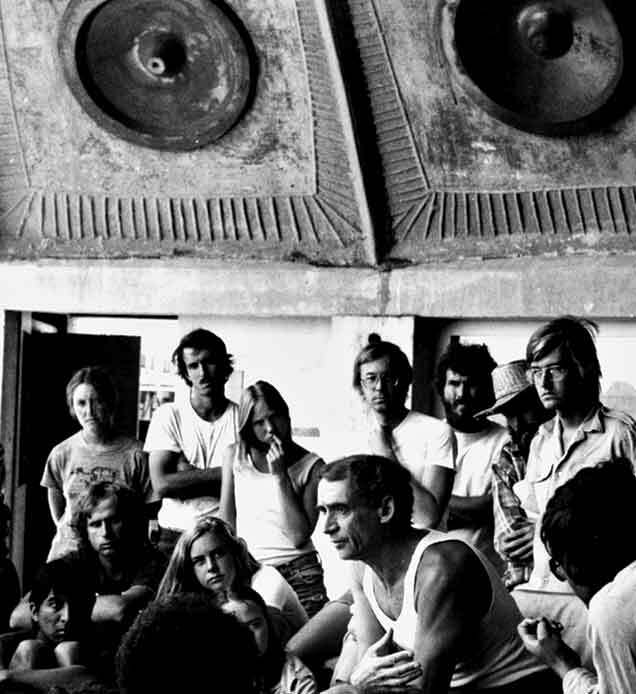 One of the biggest changes inside was the conversion of the home theater into Fred’s studio. Byrnes added an entry door to the room, allowing clients to enter the studio without having to go through the main house. 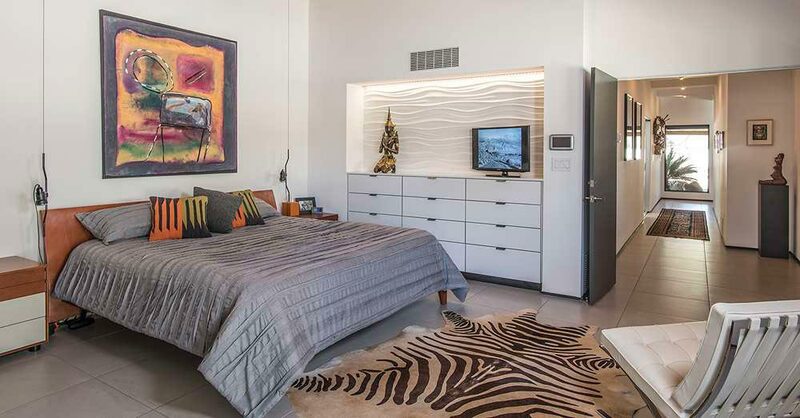 The new design gives the couple plenty of space to display their collection of contemporary art. Works by such renowned masters as Picasso, Dali, and Marc Chagall share wall space with paintings by Keith Haring, Robert Motherwell and musician George Clinton. A trio of totemlike clay sculptures by Santa Clara Pueblo artist Nora Naranjo-Morse greets visitors just inside the large steel pivot entry door—itself a piece of art—while a collection of masks from around the globe hangs in the hall outside Fred’s studio. 1. 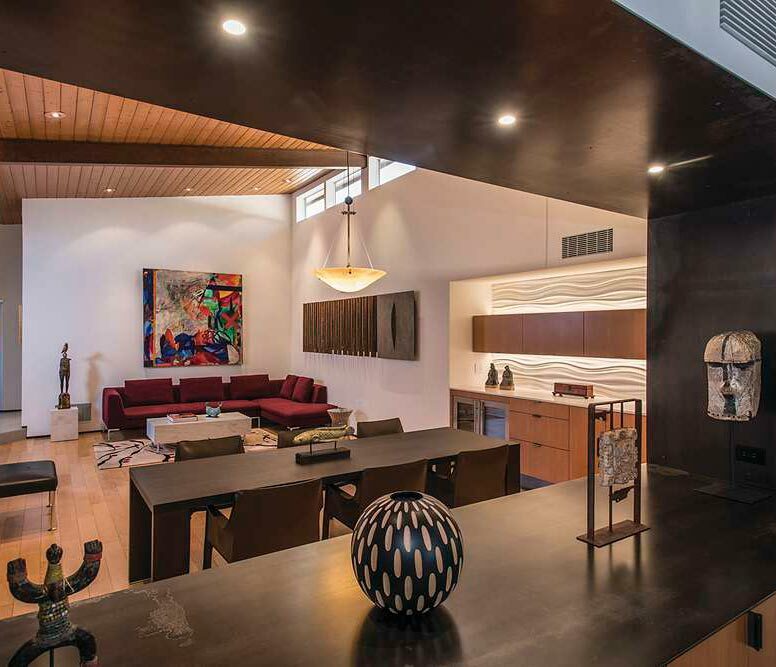 Minimalist furnishings in the great room allow the art to take center stage. A wood statue by Rand Smith stands near the sofa, while the wall installation by Pascal comprises dozens of pieces of wood that were hung individually. The colorful paintin g on the right is by Jason Mejer. 2. 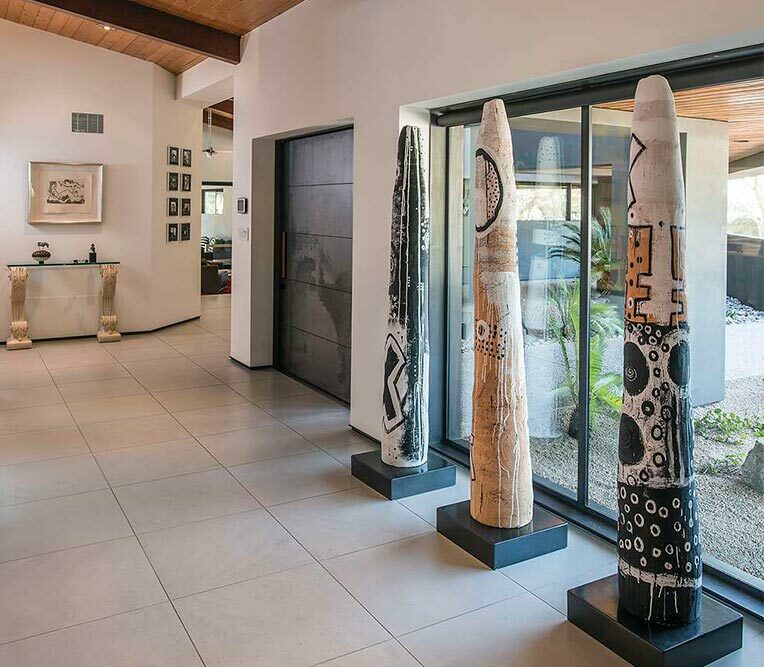 The entry hall is a fusion of textures, thanks to the steel entry door, large windows and Naranjo-Morse’s clay totems. At the far end is a hand-signed and dated artwork by Picasso. 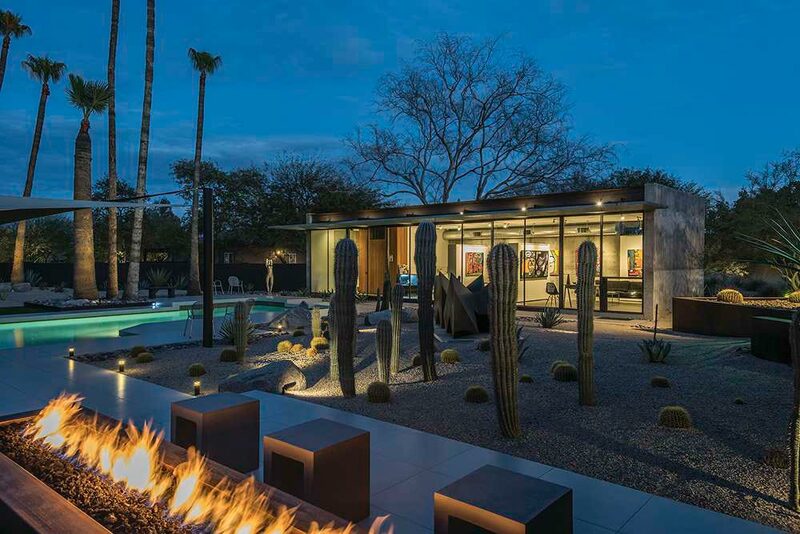 Curator Nicole Royse, who serves as an art consultant for the Tiekens and represents Fred’s work at her Scottsdale gallery, has spent numerable hours at the home. “Fred and Gail have a beautiful and eclectic collection, which they have been building since the early 1970s,” she explains. “They collect from the heart, selecting works that they enjoy. 1. The view from the sunken media room highlights the home’s ability to display art. A trio of Fred’s paintings line an angled wall, as if in a gallery, while clerestory windows let in copious natural light. The two small paintings on the right are by Keith Haring. 2. The former home theater was transformed into a bright studio for Fred. Here, he touches up a new painting while Gail, along with pup Sid, answers emails. 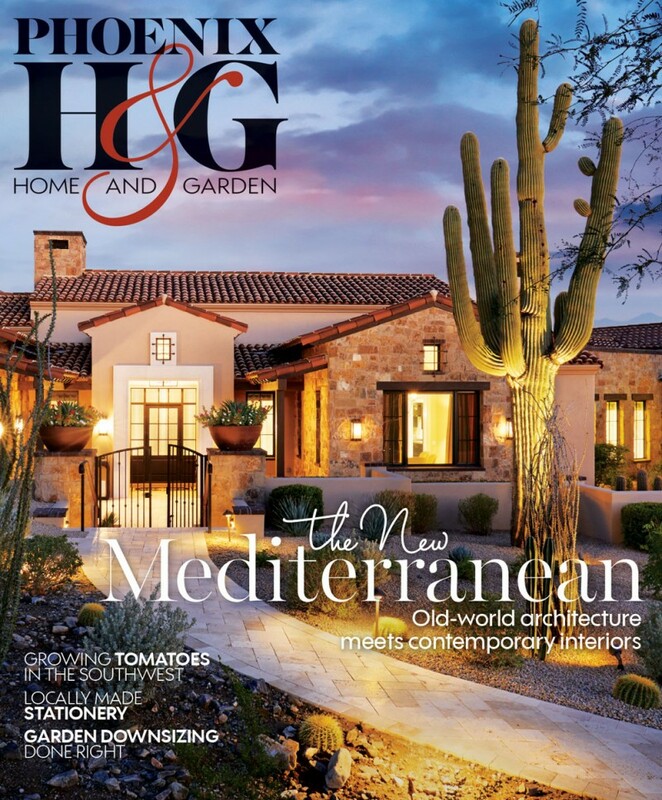 Outside, Byrnes and landscape architect Stephen Bardorf overhauled both the front and back yards, converting them from lush lawns to desert-friendly sculpture gardens. “The Tiekens were adamant that they didn’t want grass or shrubs,” says Bardorf. 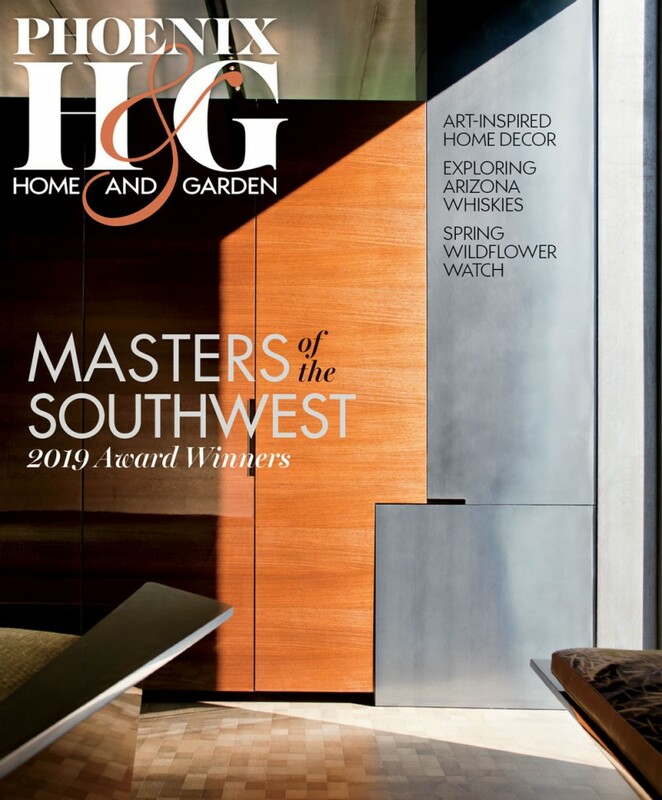 Agaves and cacti, including golden barrels, totem poles and cardons, pepper the crushed gravel and river rock landscape, ensuring that eye-catching works by William S. Cordiner, Alan Houser and Jeff Zischke remain the focal points. A wide doorway opens to the master bedroom, which is bright and Zen-like, with minimalist furnishings and neutral colors. The painting above the bed is by Michael Prepsky. 1. At night, the gallery’s glass walls provide unimpeded views of the art inside. 2. 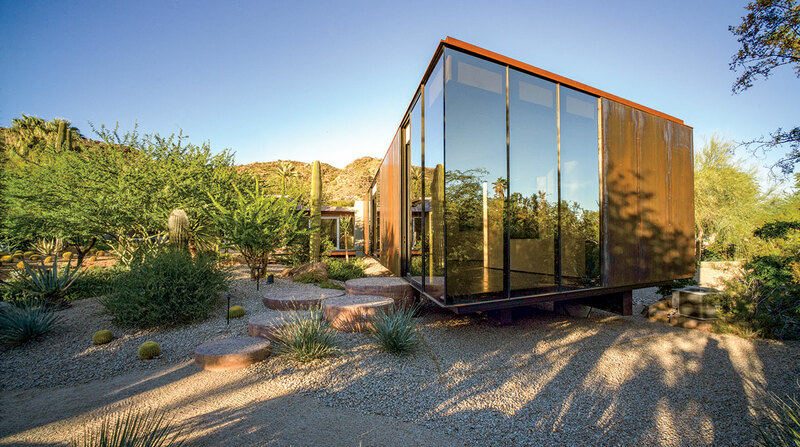 During the renovation of the home, Byrnes added a concrete and glass outbuilding, which serves as a gallery. A pair of movable walls allow the couple to customize space for each exhibit. 3. 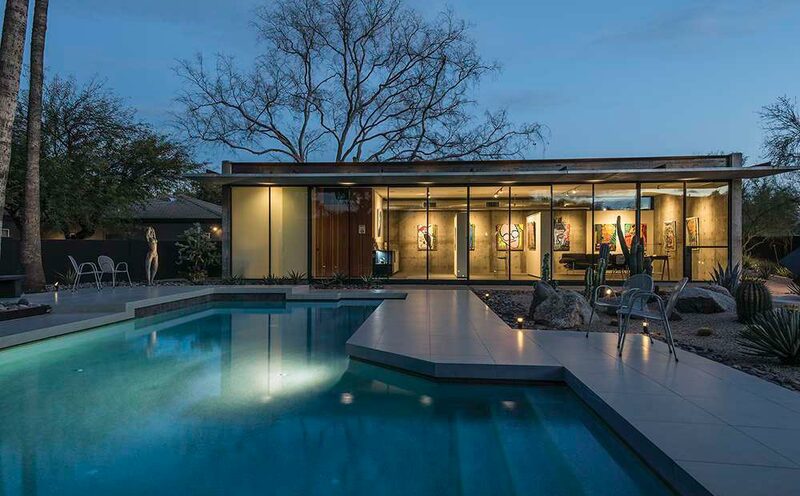 With the gallery on the left and a pool in the center, the backyard is an open-air sculpture garden. 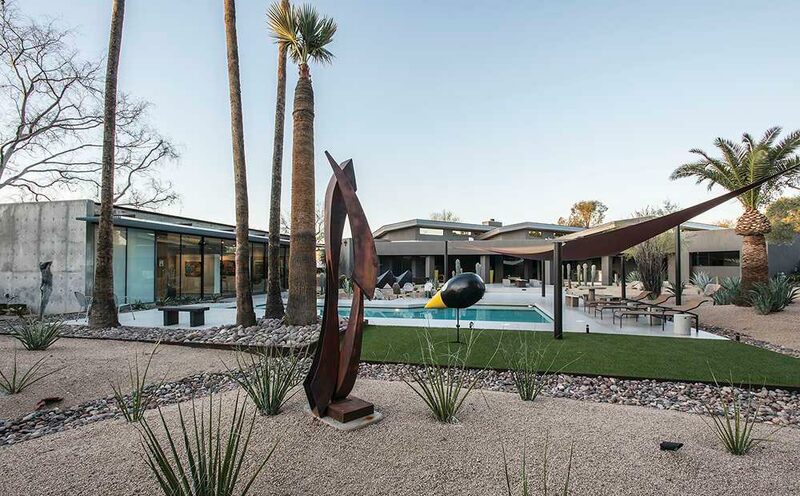 Bardorf replaced the expansive lawn with xeriscaping that highlights a collection of artworks. The black and yellow bird is Uno, a character created by Fred that represents the dangers of GMOs. 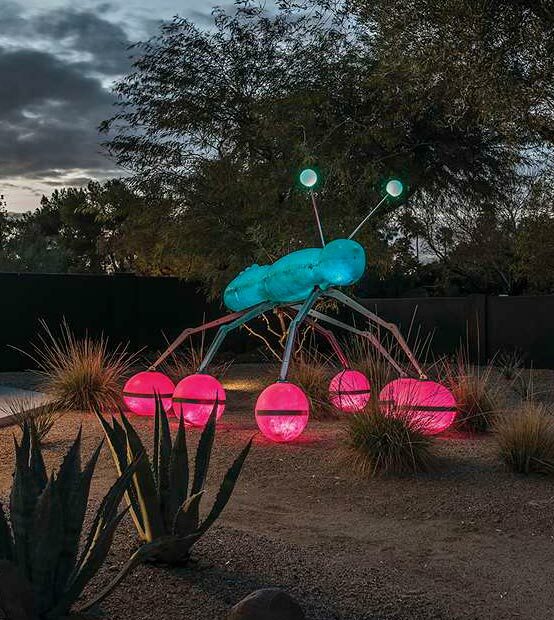 The 6'H by 12'L illuminated bug sculpture by Jeff Zischke was once part of a temporary installation for Scottsdale Public Art. The couple celebrated the opening of their gallery by hosting a show that featured more than 40 local artists. 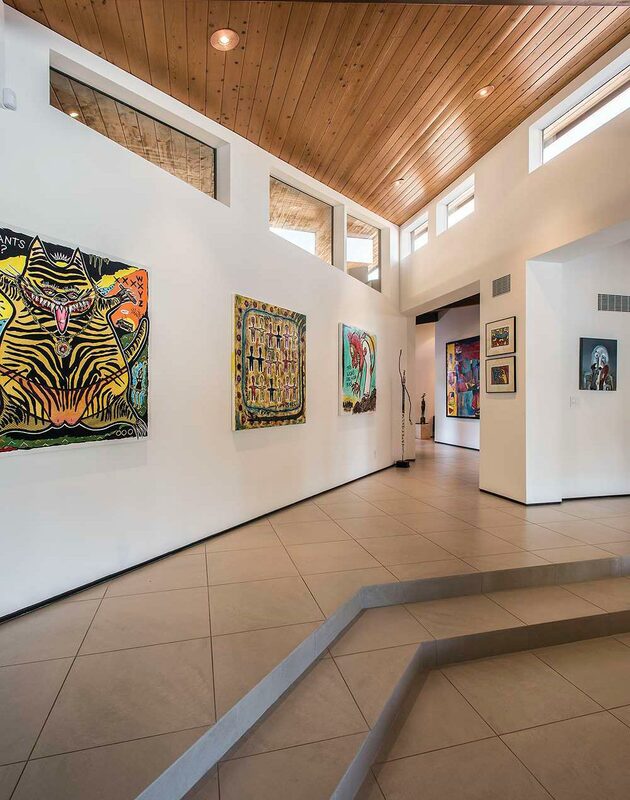 Since then, they’ve held exhibits for such noted artists as Emmeric Konrad, Richard Kressler and Kellesimone Waits, among others, and most recently, they’ve opened the gallery’s doors for a benefit for Phoenix charity Free Arts.